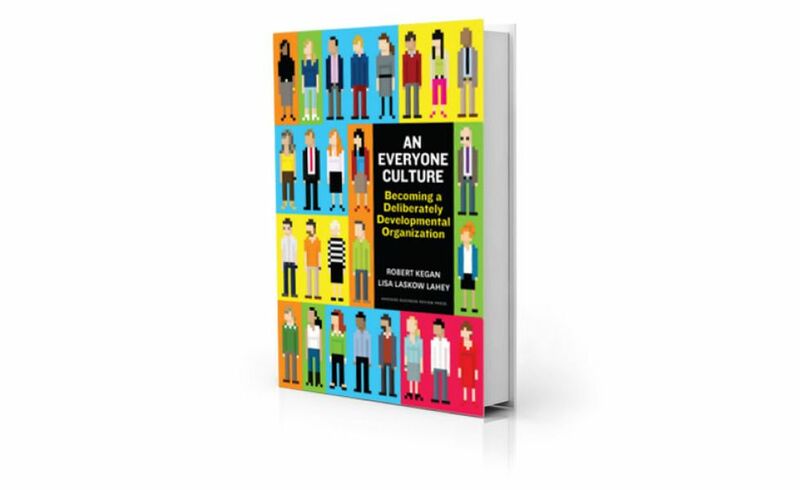 5 Questions with Robert Kegan, Lisa Lahey, and Andy Fleming, co-authors of An Everyone Culture: Becoming a Deliberately Developmental Organization (Harvard Business Press). Dr. Robert Kegan is the Meehan Professor of Adult Learning and Professional Development at the Harvard University Graduate School of Education. Dr. Lisa Lahey leads the Personal Mastery component of a new doctoral program at the Harvard University Graduate School of Education, designed to produce the public-sector equivalent of the “turnaround specialist.” Andy Fleming is the CEO of Way to Grow, Inc, the knowledge-building and service-providing home of the DDO idea. 1. Your new book explores the benefits and advantages of the ‘Deliberately Developmental Organization.’ Could you please briefly explain the idea and its importance for the future of work? Let’s be blunt: In the ordinary organization nearly everyone is doing a second job no one is paying them for—namely, hiding their weaknesses, looking good, covering their rear ends, managing other people’s favorable impression of them. This is the single biggest waste of a company’s resources. Now imagine working in a place that is sending the message, every day, “We hired you because we thought you were good, not because we thought you were perfect. We are all here to get better, and the only way we will get better is to make mistakes, reveal our limitations, and support each other to overcome them.” You’d be imagining a DDO. “Feast on your weaknesses or starve on your ego,” says Brian Ungard of Decurion, one of the companies we studied. “Do you worry more about how good you are,” asks Ray Dalio of Bridgewater, another company we studied, “or how fast you are learning?” In a DDO everyone is working every day to develop themselves, to develop those around them, and to develop the organization itself. Individual growth and organizational performance function as “one thing.” At Next Jump, a third company we feature in the book, only half of your annual bonus is a function of your contribution to revenue. The other half is determined by assessing your contribution to the company’s culture. These companies see that they can only reach their ambitious goals for business if their people are all growing. And at the same time, their people can only be growing if the business is providing all of them with a rich and meaningful set of challenges and supports for personal growth. To bring people into the DDO concept, we sometimes ask them to reflect on a high growth experience in their own work life. When was it? What were the factors that brought it about? What made it such a period of high growth for you? Most people share a time when they experienced a great challenge, something that pulled them out of their comfort zone. They also tend to talk about (1) getting some very tough feedback, (2) not knowing if they were going to make it, and (3) receiving significant support and encouragement from one or more people around them. They generally go on to say how much their experience meant to them, how it changed the way they think about themselves and their place in the world, and how it enabled them to be and do more in their lives inside and outside of work. Beginning in the 1980’s and 90’s, the idea of becoming a “great place to work” has become an aspiration for many organizations—first in the U.S. and then around the world. We certainly applaud this movement and admire organizations that have intentionally created workplaces with higher levels of trust toward senior leaders, camaraderie among employees, and pride in the work that’s being done. But given the increasingly VUCA world of the twenty-first century (volatile, uncertain, complex, and ambiguous), we’ve come to believe that being a great place to work is not enough. Organizations need to operate as great places to grow. High levels of trust, camaraderie and pride are necessary but not sufficient. Organizations need all of their people from the C-suite to the frontlines continuously developing and deploying higher levels of capability to match the rate of change going on around them. Changing your business model or value proposition, entering a new market, responding to a new competitor, developing a new product or service, restructuring your supply chain or service delivery process—these are all highly complex challenges. Organizations face more of them now than ever before and at an ever-increasing pace. Meeting those challenges requires something more than smarter strategy; it requires smarter people—people who can overcome their blind spots, who are neither overly confident nor overly humble, who can stand on the field and get above it at the same time. DDOs are the most efficient delivery system we know for growing individual and collective capability and, in particular, the ability to transform oneself and one’s team, unit, or organization. We don’t believe that such “adaptive capacity” is a commodity you can easily buy in the marketplace. You have to grow it from within. That’s what DDOs do. 2. How does becoming ‘an everyone culture’ differ from traditional approaches to talent development or strengthening organizational culture? The traditional talent management approach is for organizations to identify a relatively few “high potentials” and “business-critical” leaders and provide them with individual coaching, off-site workshops, leadership development programs, and other special experiences outside the normal flow of work. The theory of this approach is that people will bring what they’ve learned back to the workplace—but the reality is that the learning often doesn’t transfer or take hold when carried back to one’s work setting. Traditional approaches are for too few, applied too infrequently, and go on too far away from the real work. In contrast, “an everyone culture” treats all members of the organization as high potential and designs the work environment so that development happens in the regular course of work for everyone, every day. 3. While supporting people’s growth is a goal most would share, how does the DDO ensure this priority also builds business value for the firm? Decurion’s movie theaters have the highest average gross per screen. Next Jump reduced its annual turnover from 40%, the industry average in its sector, to single digits. Bridgewater was the only financial services company to make money for its clients during the worst economic crisis since the Great Depression. Are these just accidental co-occurrences—an unusual culture and unusually positive business results? We take up this question very thoroughly in our book. 4. In practical terms, how do you recommend leaders begin to realize and sustain a DDO? Let’s start with two preliminaries. First, leaders will need to recognize that any kind of significant culture change is an adaptive challenge that will take time. And there’s no one “right way” to do it. Leaders can’t take this on with a “quick fix” or a simple-minded “A to B” approach. Read and discuss our book with a group of senior leaders or, perhaps even better, a “diagonal slice group” (different areas and levels) from the organization. Choose folks who are influential and outspoken enough to engage with others. Go one or two chapters at a time and really dig in. See what kind of energy emerges around the core ideas. Is there enough enthusiasm to get started…and enough commitment and buy-in to sustain the effort? Once they get a sense of a developmental culture from the examples and exercises in the book, will the people in the room commit themselves to work publically and patiently on their own and others’ development and, most importantly, to work on the organization itself? And which, if any, of the “getting started” approaches in Chapter 7 of the book have the most appeal for them? What are their ideas? Take a clear-eyed look at your current culture. Based on our research and models in the book, we’ve developed an assessment instrument that can measure the current “developmental-richness” of an organization’s everyday culture, pointing out areas of strength to build on and high leverage gaps to close. We’ve found that going through the data on the assessment leads to a much richer understanding for people at all levels of what it takes to become more deliberately developmental and where and how they can start working on themselves, others, and the organization. Commission a pioneer group to embark on a “developmental sprint.” (The group could be the senior leadership team, an intact work unit, or a “diagonal slice” group.) The group identifies an attainable business goal, and, for a bounded period of time, engages in a mix of deliberate practices to foster their own and each other’s development, as a means to accomplishing the goal. (The practices could be self-chosen or we can offer an approach we’ve used.) Then they can report on their experience and best thinking on next steps for the organization. This is the fastest approach we know to give a group of folks in an organization a real-time experience of operating in deliberately developmental way and seeing how that can impact their own growth and relationships as well as the organization. 5. What specific advice would you offer to leaders committed to fostering greater individual and organizational creativity? Scanning the literature on innovation over the last 10 years or so, one thing stands out for us: the core dynamic that drives sustained creativity and innovation has to do with a high capacity to challenge existing assumptions. That’s what the most consistently innovative people and organizations know how to do regarding their customers and markets, as well as their internal operations. They rigorously surface, test, and transcend limiting assumptions. That same “surfacing-and-testing” dynamic, applied to ourselves, is what accelerates human development and lies at the heart of DDOs. Next Jump, Bridgewater, and Decurion are places where people are expected to surface and challenge assumptions every day—about themselves first and foremost, but also about other people and all aspects of their business. And that certainly shows in the level of innovation these organizations have achieved. So we see the DDO concept as a great, perhaps even essential, support for organizations interested in fostering more creativity and innovation at all levels and in all aspects of their operations.